Statements by the Prime Minister Alexis Tsipras and the President of the Republic of Cyprus Nikos Anastasiades during their bilateral meeting in Nicosia, in the framework of the Greece-Cyprus-Egypt Trilateral Summit. Συνάντηση με τον Πρόεδρο της Κύπρου Νίκο Αναστασιάδη. 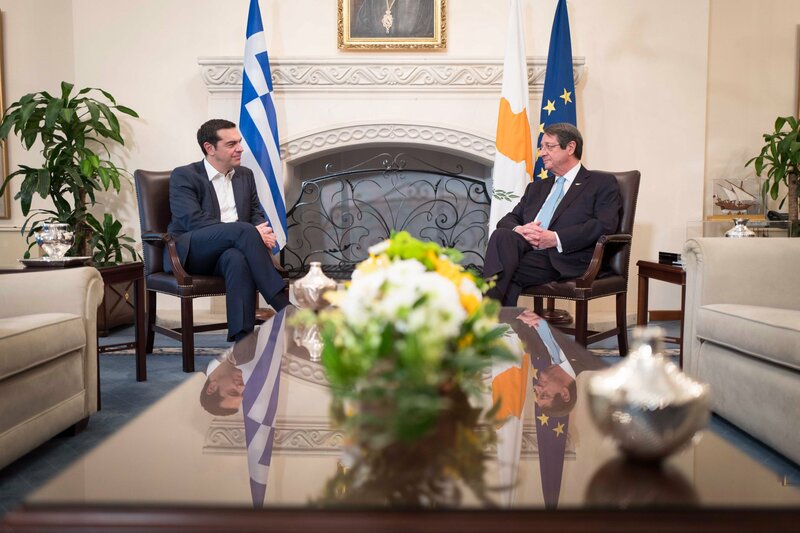 Statements by the Prime Minister, Alexis Tsipras, and the President of the Republic of Cyprus, Nikos Anastasiades, during their bilateral meeting in Nicosia, in the framework of the Greece-Cyprus-Egypt Trilateral Summit. N.Anastasiades: I would like to welcome you Prime Minister, dear Alexis, to the fifth Trilateral Summit between Greece, Cyprus and Egypt and I believe that it will be as productive as the previous, including the new areas of action on the agenda. Yesterday, we had the official visit of the Egyptian President with whom we exchange our views. Our discussion resulted in a new framework of cooperation between the two countries which extends to the trilateral efforts made and will be the subject of our current talks. I would like to say that while the bad weather was a curse for your country, your arrival brought us the blessing of rain. Let us hope that there will not be the same weather phenomena so that we will not have to deal with the problems that Greece unfortunately encountered. I would like to welcome you once again. A.Tsipras: I would like to thank you, Mr. President, it is a pleasure to be in Cyprus. I have not been in Cyprus for a long time and coming here brought great joy. I would like to point out that during this time, we have a close partnership and I believe we have achieved something important: Greece and Cyprus have emerged as two countries that are a pillar of stability in an unstable region. These trilateral partnerships with Egypt, a very important country in the region, but also with Israel, Lebanon and Jordan, Cyprus and Greece are becoming a pillar of stability throughout the Southeastern Mediterranean, and this is extremely important. I would also like to thank you for the support and solidarity that you have demonstrated from the very first moment in the great disaster, the great tragedy we have experienced. Climate change creates extreme weather phenomena. In our country, in Greece, there are floods, and here a great drought. We have a great responsibility to address this global phenomenon. I would like to thank you for your support and solidarity. And along with the rain, I wish to bring hope to the Cypriot people, who is entitled to a better future as well as a fair and viable solution to the Cyprus problem.